Anabaptists are the direct opposite of Baptists … just as anarchy is the opposite of any form of external rule (e.g. monarchy) and analysis is the opposite of synthesis. 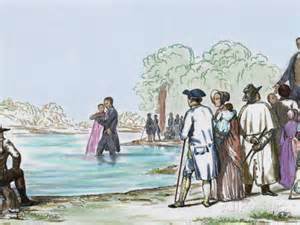 Thus, whilst members of both sects are baptised by immersion in a river, Anabaptists are always immersed in proximity to the left river bank and Baptists exclusively favour being close to the opposite right bank. The ‘left’ or ‘right’ is defined in relation to facing downstream. This approach works well most of the time, but is fatally flawed when spring high tides occur in locations where the river meets the sea and the localised river flow is thus temporarily halted. In such cases, both sects get confused as to which way to face. The result is sometimes that these antagonistic rivals both attempt to stage baptisms near to the same river bank … leading, as we might well imagine, to royal punch-ups and even the odd drowning. It is therefore no surprise that Anabaptists define ‘heaven’ as meaning the total absence of Baptists (and vice-versa). And it is for this reason that God – in his (or her) infinite wisdom – tossed a coin aeons ago to decide which of these two sects should go to the real heaven and which should be sent to hell … on the entirely reasonable grounds that even those sent to hell would deem it to be heaven due to the absence of the others and thereby be entirely satisfied and happy.